Our second full day in Kingdom of Navarra (Twitter, Facebook) (day 3 if you’re counting our travel day) started off a bit scary, due to the usual amount of stupidity that I tend to afford myself. As you’ve probably noticed from my previous post about Day 1 in Navarra, I love to go on a run in the cities that I visit around the world. I feel that it is one of the best ways to get to know a new foreign land and its people. Like an idiot always, I only carried my hotel keycard and a bit of cash in case I got into trouble and needed a taxi. 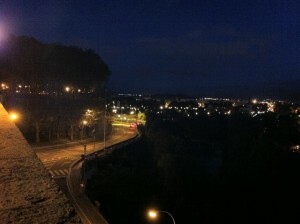 I then headed out way before dawn at about 5:50am to streets unknown. Oh, and did I neglect to mention that I have absolutely no sense of direction?…I’m a total Marcus Brody. An hour later, my 20 minute jog has clearly turned into the definition of a lost tourist, replete with Spanglish as my only tool to communicate…no phone to call for a taxi, nor to even let my #Navarra5-mates know why I wouldn’t be in the lobby at 7:45am! Not surprisingly, Navarrans don’t really like to get up early, like much of the Romantic cultures of Europe. I was more apt to find people going to BED, rather than going to work. The few people I did find were indeed, heading home after a long night of work or fun and knew absolutely no English, nor could I understand enough of their directions in their native Spanish. Yet despite this, they all tried happily and desperately to help me to find my way back to the hotel. 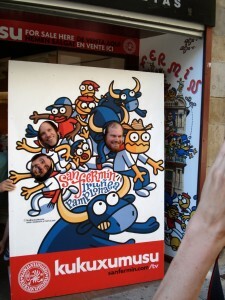 Almost two hours later, I did find my way back with the help of multiple sleepy-eyed, kind residents of Pamplona. My final savior was a saintly man that convinced me to walk to “mi casa, esta near La Iglesia,” or near the church that I knew was a landmark in the city and near our hotel. As I recognized familiar storefronts and plazas, I begged off his very generous offer to cook me breakfast in his home and tiredly jogged over to the hotel. The beautiful kindness of the people of Navarra was burned into my mind after this experience and I feel that it will never leave my heart. Despite my long morning adventures, I did manage to stumble down to the lobby at precisely 7:45am to meet the rest of our group for our long day out in the Navarran wine country. Our first stop of the morning was down in the southern end of Navarra, in its Ribera Baja sub-appellation. There we encountered a smaller rural town called Cascante that includes a large bodega known as Malón de Echaide (Facebook, WineLog). A co-op since 1951, it was founded with 1000 different grapegrowers, but with the extensive pullback in the grape growing industry in Spain over the last 15 years, their membership has been pared down to its current collective count of ~200. 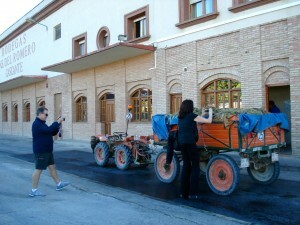 The winery was in full swing when we arrived with the harvest hitting all across Navarra. We then made the embarrassing mistake of clambering right over and onto the scale where winegrowers would weigh their grapes, in order to take some photo. I’m sure the farmer wasn’t too pleased with Cuvée Corner‘s Bill Eyer (Twitter, Facebook), Wine Harlots‘ Nannette Eaton (Twitter, Facebook), and myself adding to his initial tare (no scales were harmed in the making of this post). Following our gaffe, we headed inside for a tasting of their value wines and tour of the very active winery, including their in-house bottling line, all courtesy of Patricia Ansorena Sanchez. The wines of Malón de Echaide are a perfect example of the high level of quality for the price that you can get with the wines from Navarra. The wines we tasted were ridiculously cheap, with the majority of them hitting your wallet for only $5 (~¢1.30)…that is, if they were available in the US. Get on it, importers! The most expensive of the lot we tasted, from their Viña Parot Reserva line, still would only top out at around $16 in the US. 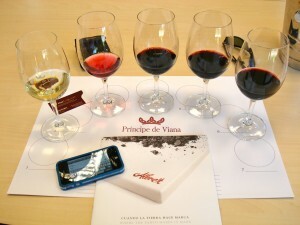 The most fascinating wines for me were the value line, including one that garnered a WKBadge. 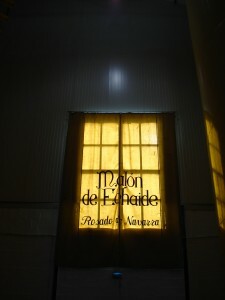 The 2007 Malón de Echaide Navarra Crianza, a wine that by Spanish law has been aged at the bodega for a minimum of 2 years with one of those in oak, showed incredible QPR. Featuring flint, cherry fruit and toast in the nose and all of that plus black currant and dusty tannins on the palate, this wine still is only in that (future) $5 range. 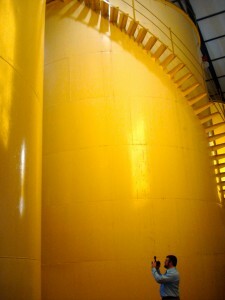 A later tour of the winery was where we discovered the active bottling plant (see the video below), along with a massive underground barrel cellar, and possibly one of the largest fermentation tanks that I’ve ever seen, at well over 100,000 gallons. Our next stop was quite some ways away and to the north from Echaide and we had to cross the river Ebro to get to it. 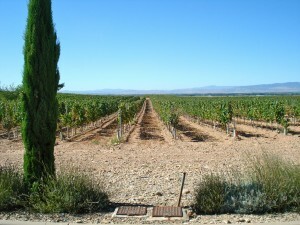 The Ebro river runs through a number of famous wine regions in Spain, including both Navarra and Rioja. We crossed it over a rather dramatic hanging white steel bridge, but I was unable to get a good shot of it from the back of our speeding minivan. 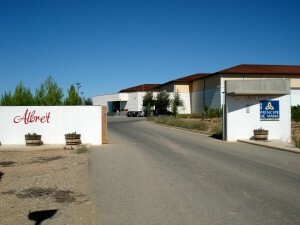 Our destination was Bodegas Finca Albret (Facebook, WineLog). It is found in the Ribera Alta sub-appellation and it is the first property developed by its parent, Bodegas Príncipe de Viana (Facebook), an older bodega and where we would later have a stunning, primarily vegetarian lunch. Here we were greeted by Communications Manager Marifé Blanco along with Albret’s viticulturalist for a vineyard tour. The soil of Albret is rocky alluvial, somewhat similar to Châteauneuf-du-Pape in the Rhone Valley of France. The vines surrounding the bodega and seen in the photo to the right were Graciano, a variety and resulting varietal wine that I found to be one of my favorites from Navarra. Marifé said that Graciano is a very challenging grape to grow, much like Pinot Noir. In the neighboring region of Rioja, she said that they say: “Graciano? Gracias No!” Including the Graciano, the bodega has a total of 400 acres of vineyards, both surrounding the winery and in the nearby rivers and hills. 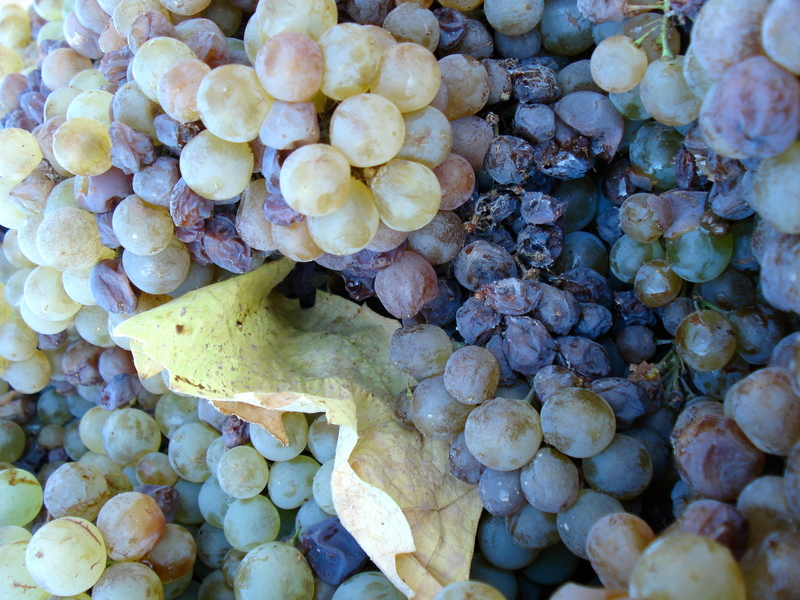 The 2011 vintage had been good to them so far, with warm, even weather that had very little rain during harvest by that point. 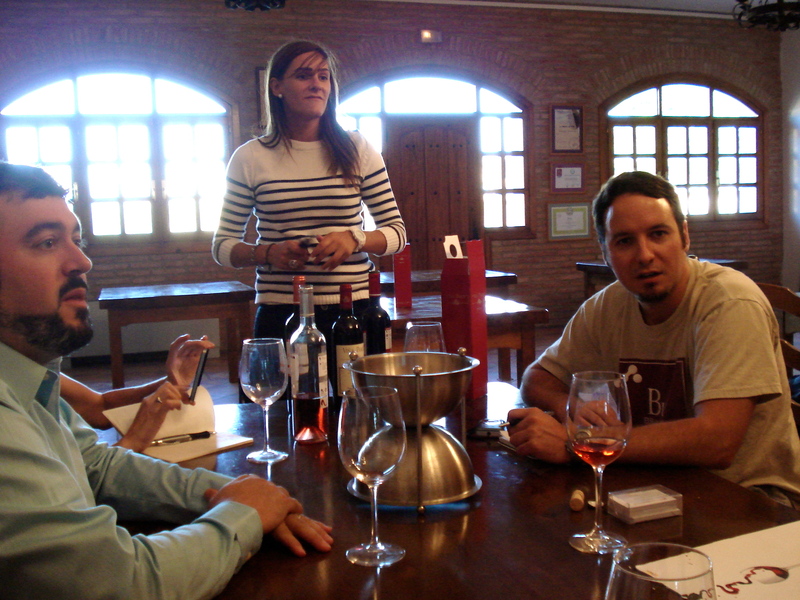 Our tasting was led by the Enologist/Winemaker, Isabel Lopez de Murillas Manrique. These wines were definitely at a higher price point than Echaide, but were still mainly in the $24 – $32 range. My favorites were the Reservas, natch. 😉 The Albret Navarra Reserva 2006 featured a closed nose, indicating that it needed some aging, but the palate showed off some very nice ripe, juicy red and black cherry, powerful, fine tannins, and an earthier cherry tobacco finish. Meanwhile their flagship wine, the Albret Navarra La Viña de Mi Madre Reserva 2006 also needs plenty of aging, but includes many of the flavors of the standard Reserva, plus chalkier tannin and more of a dried black fruit on the palate, along with cigar box. 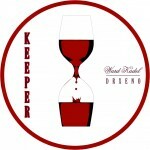 Both wines garnered KeeperWK badges. After the previously mentioned astounding lunch, we drove back up north to Pamplona and most of us took a long-awaited snooze on that longer drive back to our hotel, the Palacio Guandelain. After another brief respite, we congregated again for a guided tour of Pamplona, led by a wonderful tour guide. Pamplona is a city of 200,000 residents year-round and can swell to over three times that many for the Festival of San Fermín, or the “Running of the Bulls,” made so famous by Ernest Hemingway. Indeed, they have many famous landmarks within the city, devoted to Hemingway. We even were able to drink one of his favorite digestif following dinner that night, the local speciality called Pacharán. It is made from sloe berries and anisette and served over ice. I immediately became hooked on this, being a fan of many herbal aperetis and digestifs, and was rather delighted to be drinking it at Hemingway’s old hangout, Café Iruña. With that, we called it a night and collapsed into bed, resting up for Day 3! Our travels across Navarra were tagged in realtime on Twitter using the hashtag #Navarra5. The intro post in this series can be found earlier on Vinopanion, with Day 1 being my previous post in this series. You can find all of the photos & videos from this fabulous trip to Navarra, Spain (Twitter, Facebook) (and a little to Basque Country) on my Flickr in their own set and tagged with “Navarra5“. All of my runs that I took (including getting lost!) 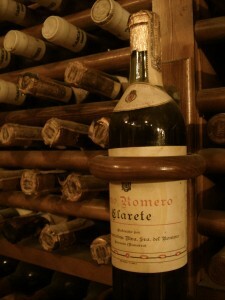 are on my MapMyFitness, titled “Wines of Navarra“. Lastly and most importantly, all of the awesome wines that we had from our first day are listed below and all are tagged with “Navarra5” so that you can list them in your own WineLog. Cheers! Nose: Ripe black cherry with light flint and touch of toast and anise. Palate: Medium to full bodied, with bright and deep black and red fruit, light, drier coating tannins and a black currant finish. 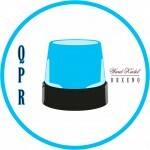 Very good for this price, if it were available in the US: QPRWK. Color: Medium garnet, light garnet edges. Nose: Earthy here, with still good drier black fruit, cool anise and charred earth. Palate: Cool and bright mouthfeel with dried black fruit and tobacco with cigar box out into the lighter tannin finish and dried earth. 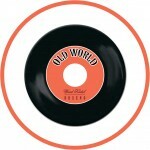 Good: OldWorldWK. Color: Darkest garnet, darker garnet edges. Nose: Flinty and hot, rocky earth. Fruit is closed but does have some black poking thru. Palate: Very red cherry licorice, with lots of that savory tobacco and hot stone here as well, good acidity and powerful but fine tannins. Finish is cherry tobacco and long and earthy: KeeperWK. Nose: Cool red fruit, big fresh anise and dark cocoa as well, earth here as well. Some kind of violet florals add complexity. Palate: Bigger acidity, supporting chalkier tannins, big anise here as well. Chocolate & tobacco, dry bigger tannin structure. Good and very young. Ends with black fruit and some of that cocoa, a bit of juiciness as well. Good but young: KeeperWK.